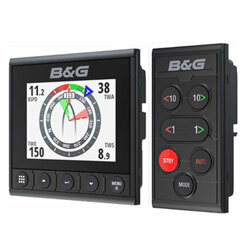 This intuitive keypad can be combined with a B&G Triton2 Display to create a fully-featured autopilot controller, including B&G's Intelligent Sail Steering functionality and Smart Maneuver controls. Multi-purpose sailing instrument and autopilot display with a 4.1-inch color screen, optically bonded for zero condensation and featuring trans-flective LCD technology for exceptional contrast and visibility in all lighting conditions. 8mm mounting height matches other B&G MFD's and system component.